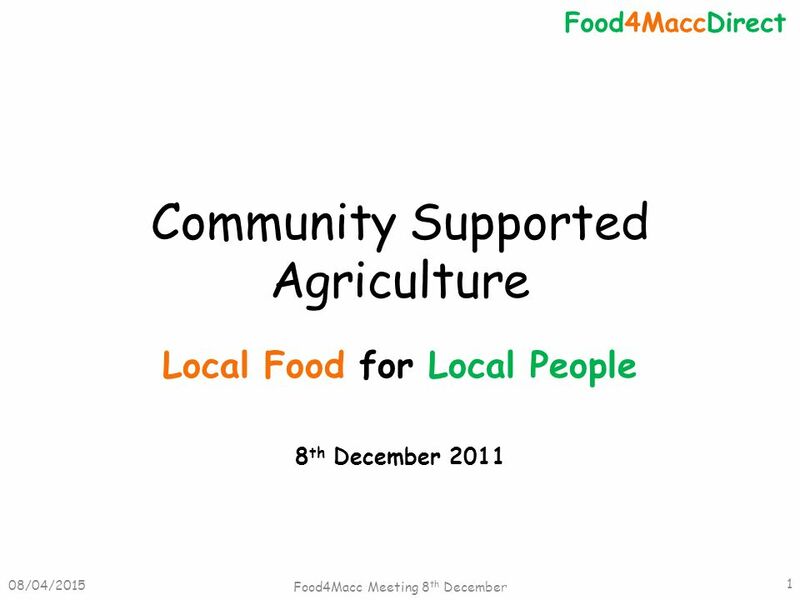 Community Supported Agriculture Local Food for Local People 8 th December 2011 08/04/2015 Food4Macc Meeting 8 th December 1 Food4MaccDirect. 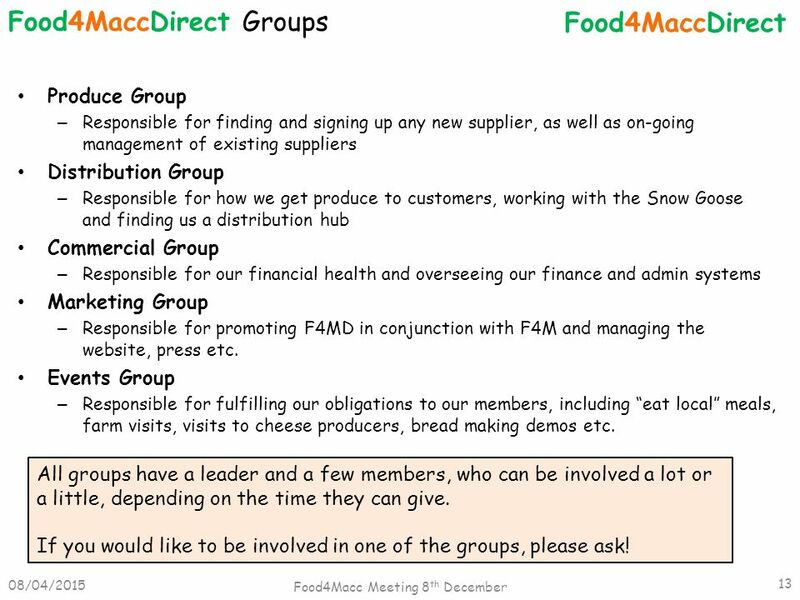 13 Produce Group – Responsible for finding and signing up any new supplier, as well as on-going management of existing suppliers Distribution Group – Responsible for how we get produce to customers, working with the Snow Goose and finding us a distribution hub Commercial Group – Responsible for our financial health and overseeing our finance and admin systems Marketing Group – Responsible for promoting F4MD in conjunction with F4M and managing the website, press etc. 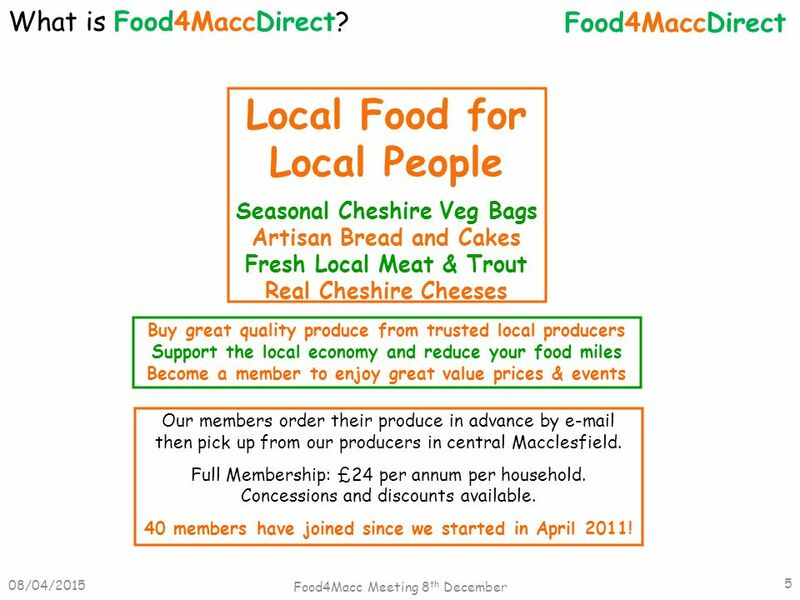 Events Group – Responsible for fulfilling our obligations to our members, including “eat local” meals, farm visits, visits to cheese producers, bread making demos etc. 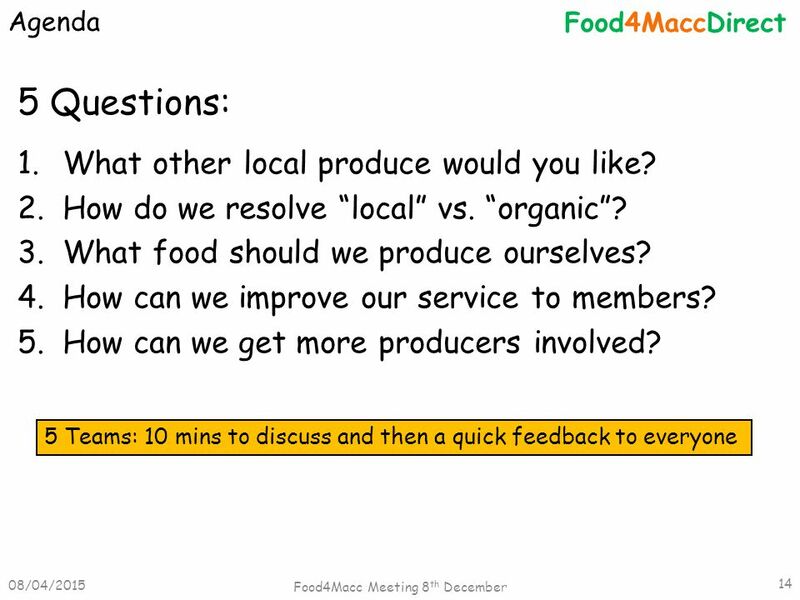 08/04/2015 Food4Macc Meeting 8 th December 13 Food4MaccDirect Food4MaccDirect Groups All groups have a leader and a few members, who can be involved a lot or a little, depending on the time they can give. If you would like to be involved in one of the groups, please ask! 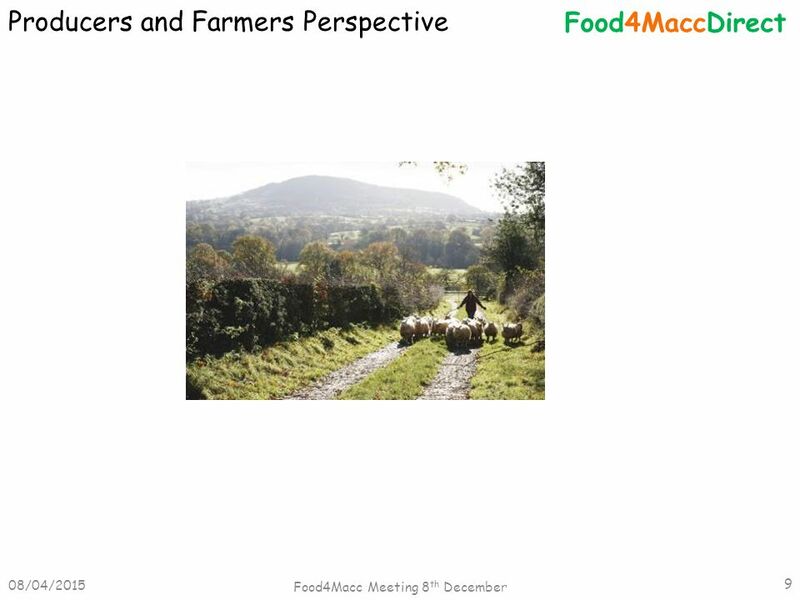 Download ppt "Community Supported Agriculture Local Food for Local People 8 th December 2011 08/04/2015 Food4Macc Meeting 8 th December 1 Food4MaccDirect." Farm to School What are the goals of Farm to School? 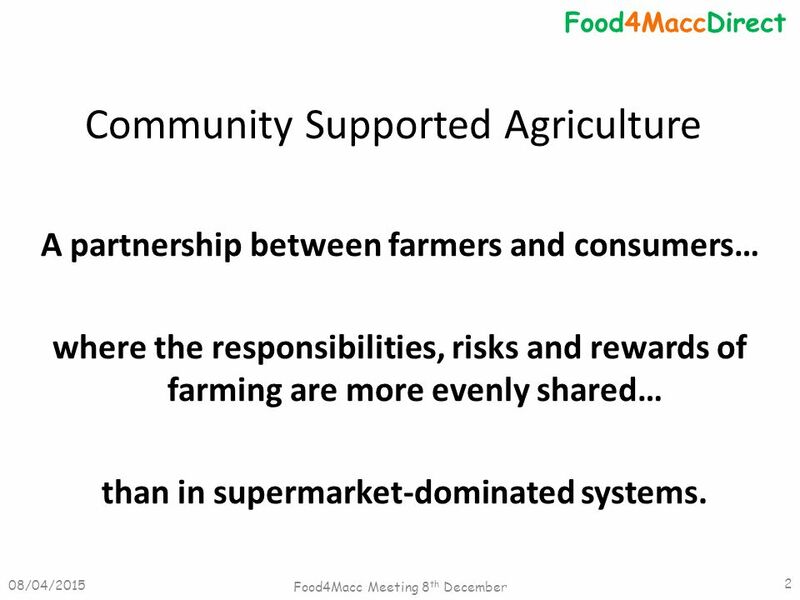 Expand educational opportunities Improve nutrition Support local food systems Strengthen relationships. 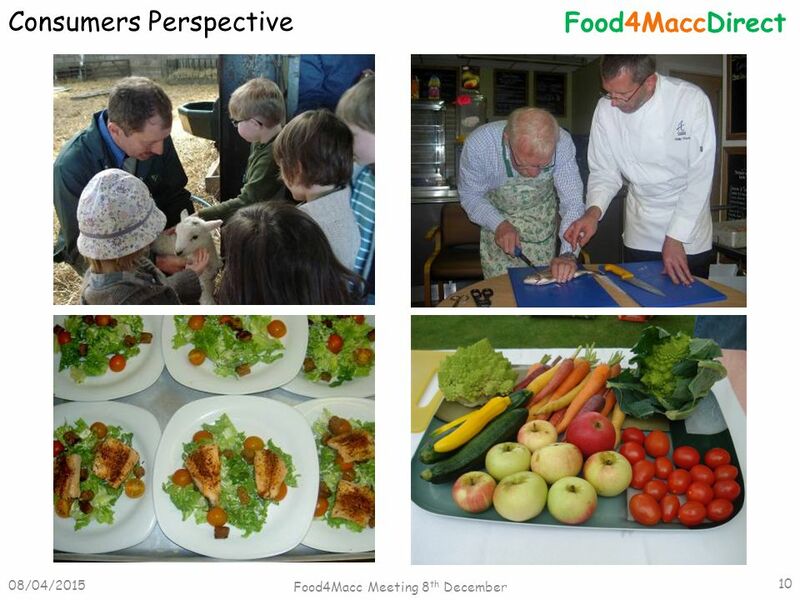 Good Food Good Mood COMENIUS Multilateral school partnerships GB1-COM From the field to the table By Rossi & Capuani. Meat and the consumer meatandeducation.com 2011. Chapter 10 Fashion Distribution Buying Fashion Selling Fashion. CATERING SERVICES WORKING TOWARDS A BETTER ENVIRONMENT Gloucestershire Hospitals NHS Foundation Trust Catering Department. 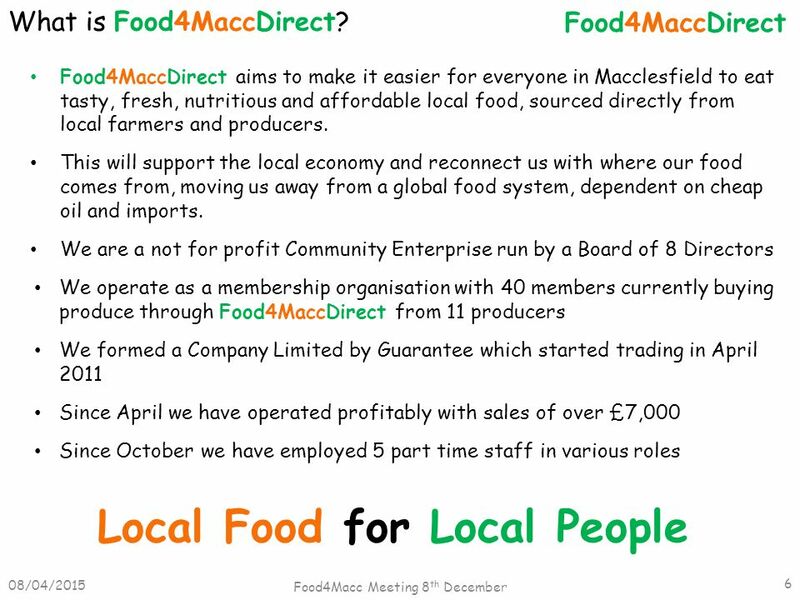 Food Enterprise Transport EnergyCharitable Company Limited by Guarantee 2025 Connecting Dunbar Energy Audit Team BeGreen CIC Dunbar Community Energy. © ASDA COMMERCIAL IN CONFIDENCE: No reproduction, disclosure or other use is permitted without license. 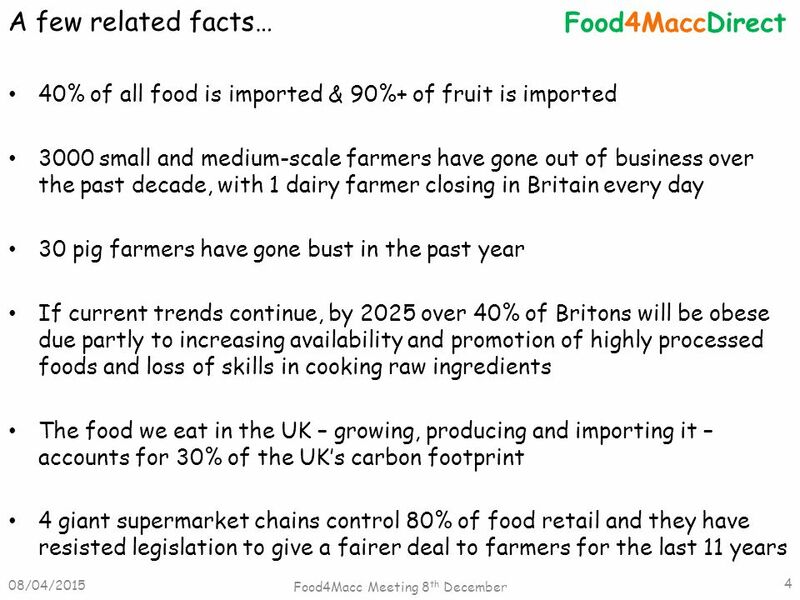 A Supermarket’s Perspective On Local Sourcing. 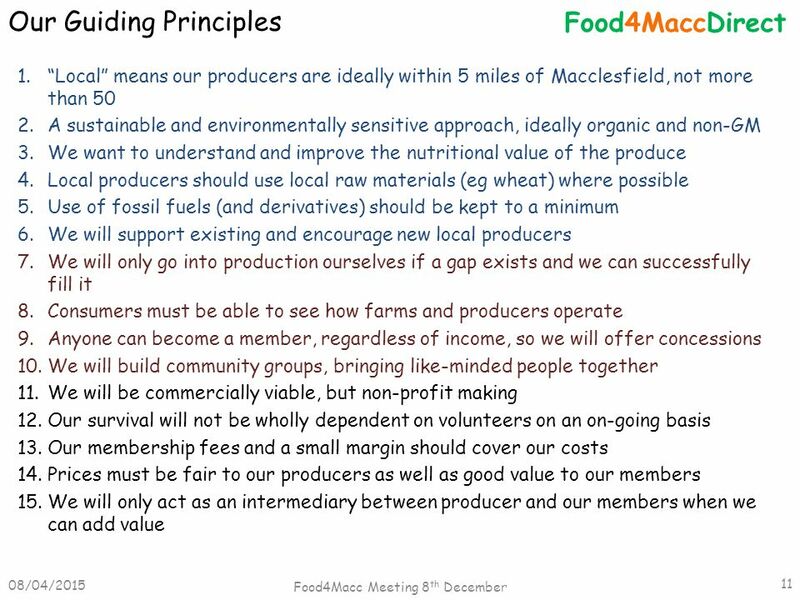 Asda Sustainability A Retail Perspective Julian Walker-Palin Head of Corporate Sustainability. In contrast… European sales have increased 25% since the start of the global economic downturn. 1 BOGOTA SEPTEMBER 2014 «Scaling up sustainable agriculture and optimizing the value chain» Karla Canavan Bogota September 2014. 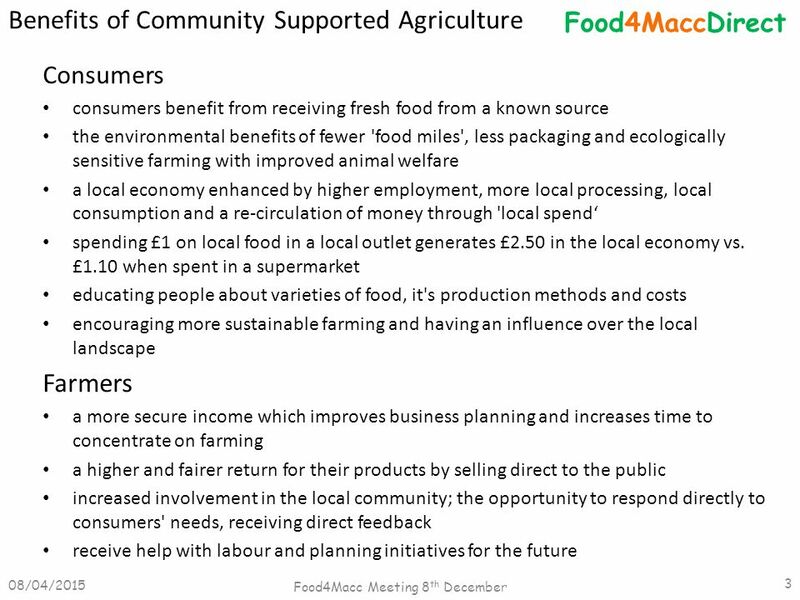 Pros and Cons of Increasing Local Food November 18, 2011 By: Bob Harmon. “School Gardens Lead to Healthy Bodies and Healthy Minds” Green Schools Conference March 28, 2014 Sacramento, CA. 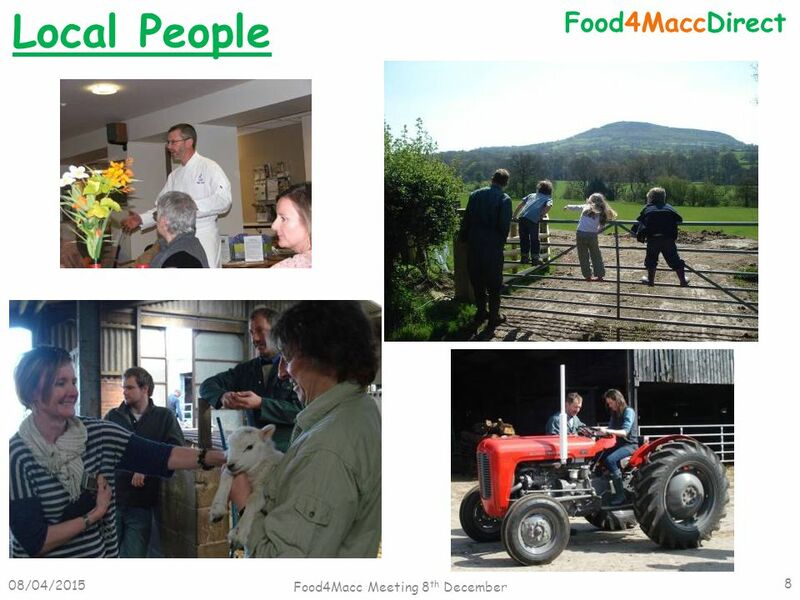 The Fife Food Network Promoting good quality food and drink experiences in Fife and beyond through the development of greater links between local food. Fair Trade A new way of consumption. What’s fair trade ? Fair trade is an organized social movement and market-based approach that aims to help producers. 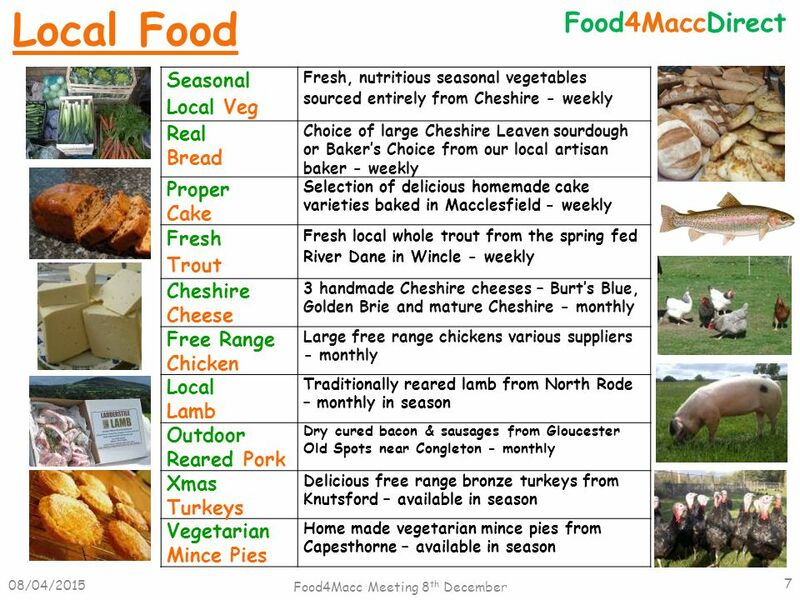 © British Nutrition Foundation 2005 – BNF Food Life Skillswww.nutrition.org.uk Budgeting Module Number: 14.